The name on everybody’s lips in politics right now is… Pete Bootigedge. No. Pete Beutigeg. No. Pete Buttajeej. 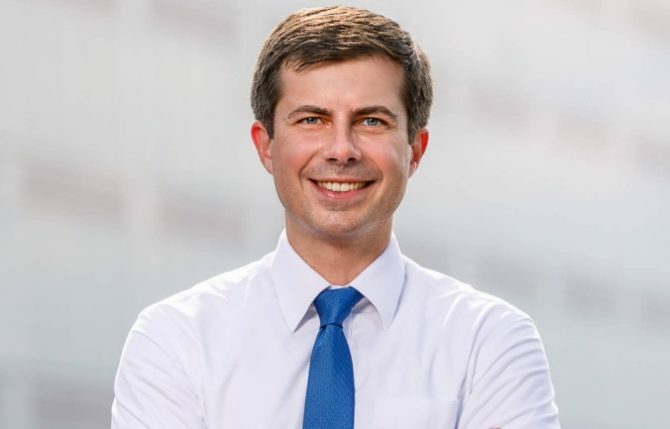 OK so it’s extremely difficult to pronounce out South Bend Mayor and Democratic presidential hopeful Pete Buttigieg’s name. But no matter how his name is coming off people’s lips, there’s one undeniable fact — it’s coming off their fingertips even more. Google just released two very interesting charts showing the trends in search results for the Democratic 2020 field. In the first chart, you see how very crowded the race is right now. The second shows how gay South Bend mayor Pete Buddha-judge has spiked in web searches. This certainly jives with the anecdotal buzz we’ve been seeing around Boot-a-judge. And that has translated into dollar bills. In his first quarter of running for president, the until-now unknown mayor has raised an impressive $7 million. The more voters get acquainted with Buttigieg, the more they seem to like his refreshing candor and intellectual approach to the issues. In other words, the exact opposite of what we have now. The same affection goes for his husband, Chasten, whose somewhat sassy Twitter page has become a source of endless delight. In a political climate that often has us searching for the nearest sand hill to bury our heads in, we can definitely get into following the Buttigiegs on whatever path their destinies lie. Find Dan Tracer on Instagram. I just contributed to Mayor Pete, so he has 7 million and $ 25.00 now. WOW. Imagine having an intelligent president again! I can dream. well I guess he’s happy and healthy due to him having orgasms homo-sexually!!!!! It’s easy if you just remember that it’s “BOOTY-JUDGE”. As I’m sure he is. Not all gay men think what this guy is doing is okay. He is a spoiler, an individual showboating doesn’t evoke change either within or for the gay community, he is merely promoting himself (and his book). Pete’s personality is fine, I do not use gender attraction or gender identity as an issue when deciding what the person is eligible for. You go Pete! But we need to know …. is Mayor Pete a boxers or briefs guy?